This blog post references the version of the Better Care Reconciliation Act introduced in June 2017. EPI will update the analysis if newer versions of the bill are significantly different. In anticipation of cuts in federal spending, we often fail to consider the extent to which state governments will be obliged to pick up the slack when the cuts include grants-in-aid to the states. This concern applies with particular intensity to the largest item in most state government budgets: the Medicaid program. The Republican Senate initiative to “repeal-and-replace ObamaCare” with the so-called “Better Care Reconciliation Act (BCRA)” makes significant reductions in federal grants to state governments for Medicaid. The Congressional Budget Office estimates that by 2036, these cuts will rise to 35 percent of spending under current law. It should be noted that current-law spending levels in the future accommodate expected increases in health care costs. Under the BCRA, future Medicaid spending might be higher than current-year spending, but it would still fall well-short of what would be necessary to absorb those future increases in health care costs. That is why the BCRA is said to cut “current services” spending, a concept that reflects projected increases in health care costs and Medicaid beneficiaries. An important analysis by Allison Valentine, Robin Rudowitz, Don Boyd, and Lucy Dadayan provides insight into the impact of the effort by Republicans in the House of Representatives’ effort to abolish ObamaCare. At this point, however, it looks like the House plan is a dead letter. If the Republicans succeed in eliminating the ACA, the most likely route is by passing a plan in the Senate, then getting the House Republicans to swallow the results whole. Any reopening of negotiations in the House on the details of the Senate plan is likely to blow up the entire effort. Even so, passage in the Senate is by no means assured. One of many reasons that Senate enactment is dubious is the stark differences in Medicaid cuts among the states. Senators represent entire states, so differences in state Medicaid funding allocations are more readily associated with each state’s senators. 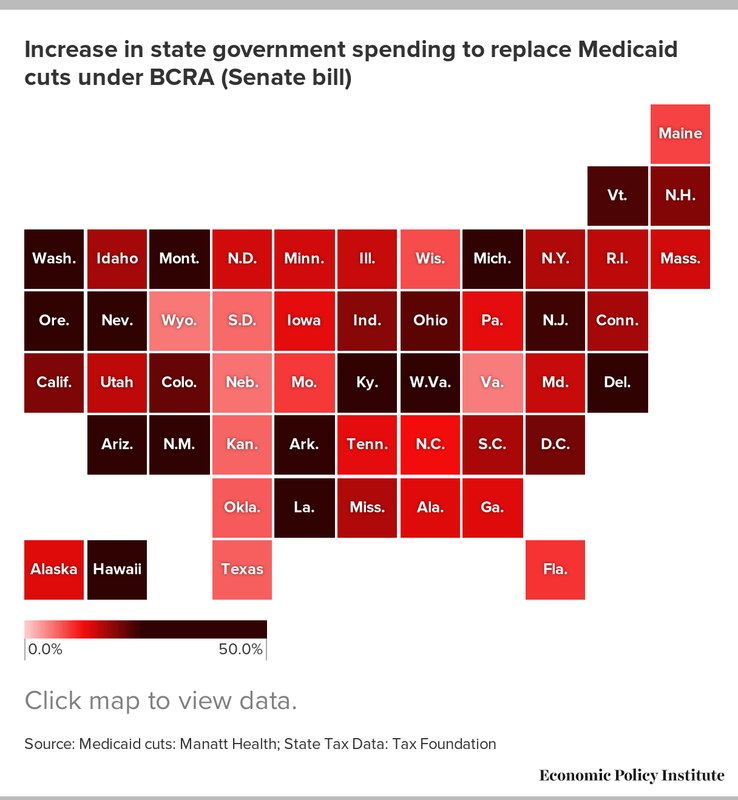 Political discord may be heightened because differences in cuts among states under BCRA are without rhyme or reason. The map below reports projected percentage cuts in Medicaid grants to states estimated by Manatt Health, in cooperation with the State Health Reform Assistance Network, with support from the Robert Wood Johnson Foundation. To add context, we provide comparisons to rankings of state per capita personal income and approximate estimates of the impact of BCRA cuts on selected state government revenue sources. Clicking on a state shows the cuts as percentages of state government spending, as estimated by Manatt. The following line shows the equal proportionate increase in state and local taxes per capita using data for 2014. (This understates the potential tax increase to the extent non-tax revenues or deficits are not used to replace the Medicaid cuts.) The next line shows how much state and local individual income tax would have to increase to offset the cuts. For states with no income tax, we provide a final line to show the analogous increase in state-local general sales taxes, along with the change in the combined state and local government sales tax rate. For states with no income or sales tax, or very minor ones, the cuts would need to be made up by some other means. For example, the federal cut to Medicaid is equivalent to an almost 44 percent cut in Kentucky’s state spending. In order to make up for the cut, Kentucky could either increase income tax and/or sales tax. If they decided to increase their sales tax to compensate for the cuts, it would have to be increased from 6 percent to 19.4 percent. The arbitrary nature of the cuts is pointed up by the associated personal income levels in the states. States such as New Mexico, Kentucky, Arizona, and West Virginia find themselves in the top ten in terms of the largest percentage level of cuts, and simultaneously among the ten states with the lowest per capita personal incomes. This directly contradicts the current Medicaid grant formula, which awards more money to states with lower incomes. Under BCRA, Medicaid cuts actually grow larger and more rapidly after 2036—the period shown above—underscoring the basic infeasibility of the BCRA.